Discussion in 'Road Racing Forum' started by Tommy J, Jun 8, 2018. Got to solve and fabricate brake cooling too. Which gauges did you go with? Novice question here, but I'm thinking three bottles of RBF600 to flush out the old SRF? Two should be enough but buy three so you’re ready for your next pre track day bleed. I ordered the 2018-19 GT FRPP Suspension set-up (GT350 springs and sway bar w/Magna Ride VDM software upgrade). I’ve been riding on the springs and sway bar setup for a couple of days now. Springs settled nicely and noticeable difference. The Vorshlag Camber Plates are awesome. In the package comes the dongle that you hook up to the car via usb connection to your computer. You have to log on to FRPP and download the software to get the programming via a voucher of your purchase. Takes about 5-10mins. Mines took 3min. I was unsure if it took or not and did it again. Could hear the PCM doing its thing with the normal lights flashing etc. for a min I thought I did something wrong, for the tire PSI wasn’t reading for about 4mins. Couple creeks and squeals so I don’t know if it’s the dampeners adjusting or just the springs still being new. Going to have everything checked out and re-torqued this week. So much tighter and responsive in sport mode as if I was driving in track mode. Also put a washer where the sway brackets go to allow some movement as it was recommended where I got the service and track alignment installed. Very important to spend the extra money on adjustable end links when you're doing this. I received a lot of knowledge as the install was taking place, asking questions why this why that. Was very helpful and confident I could do it myself next time. Alignment however is a different story. Next up will be replacing all the factory rubber bushings throughout the car. Going to be so much fun...not! There is a SCCA and NASA Prep Event that I'm going to to get all the formalities done e.g. tech sheet. Apex3V and VoodooBoss like this. The ProCal tune for the Magna Ride was pretty simple and timeless. Just have to make sure you follow the directions to a T and you're all set. I haven't driven a GT PPL2 or GT350R, but I can tell you this tune for the Magna Ride is serious and I can't wait to get it on the track. I'm getting my inspection for HPDE's and TT done tomorrow. Wondering if you guys had any input in what to look for, have done and everyday alignment specs I should run on stock tires for now. Don' t want to put my track tires on just yet. Want to test what I have done to the car now then put on the track tires/wheels. I must say the FRPP Knuckle to Toe Link bearing and Cortex Monoball kit is a no brainer when it comes to improving the handling of the S550. Getting started Ford put some authentic locktite on the bolts, was hell getting them off. I had a mechanic talk me through it and showed me how to install the bearings. As I wasn't comfortable doing it, but of course he made it seem so simple. Because Texas has many back roads and I wasn't going directly to the track I had to test it. Punching the throttle from a dead stop, there was no stutter, excessive wheel hop (which I believe and feel that decent tires and these bearings will eliminate 90% of it) or spinning. Felt like the suspension just committed at the same time, moved as one and felt great. No noise vibration what so ever, even with deleting my back seat I hear no extra. I took some back road corners hard as I could for street driving and it was just point and shoot. No hopping what so ever. You definitely can tell there is more power being put to the ground and grip comes a lot faster for the 4's. The Monoball Kit is on another level!! Taking a twisty road back from Austin and the only one on the road for awhile....I trusted the car more as I practiced looking ahead of the curve and steering and pointing to where I wanted to go. I know it is not the same as driving on the track, but for now it is the closest way I can say how I feel. Like anything, you have to be on the car heavy to feel and notice any of the improvements from the modifications. When I hear others talk about "Load" on a particular side of the car, I understand more of what they are referring too. I can't wait to get to the track and fully experience what these mods did for the chassis and the car. I know I will be more confident on the track entering/exiting the corner and getting on the power harder as wheel hop is near eliminated. I think after awhile and some seat time, I'll do the sub-frame and be good with the suspension for quite some time. DCC, The_Dead_Cow and ArizonaBOSS like this. The MGW X-Spec is fricking awesome. Still some breaking in that needs to happen, but damn that thing feels good. Like an extension of the transmission as you feel every damn thing. I likey! Bill Pemberton, TymeSlayer, ArizonaBOSS and 1 other person like this. flyhalf, DCC and ArizonaBOSS like this. So I'm in the market to change out the rear spoiler for the GT350R spoiler. However looking at the trunk lids from Anderson Composite I'm a little confused in choosing the best option (double-sided carbon fiber, carbon fiber OE). Then matching the spoiler with a front splitter is a concern. Thoughts? Have you considered either buying a new or used OEM deck lid? It's a lot more important to remove weight from the front of the car than the rear. 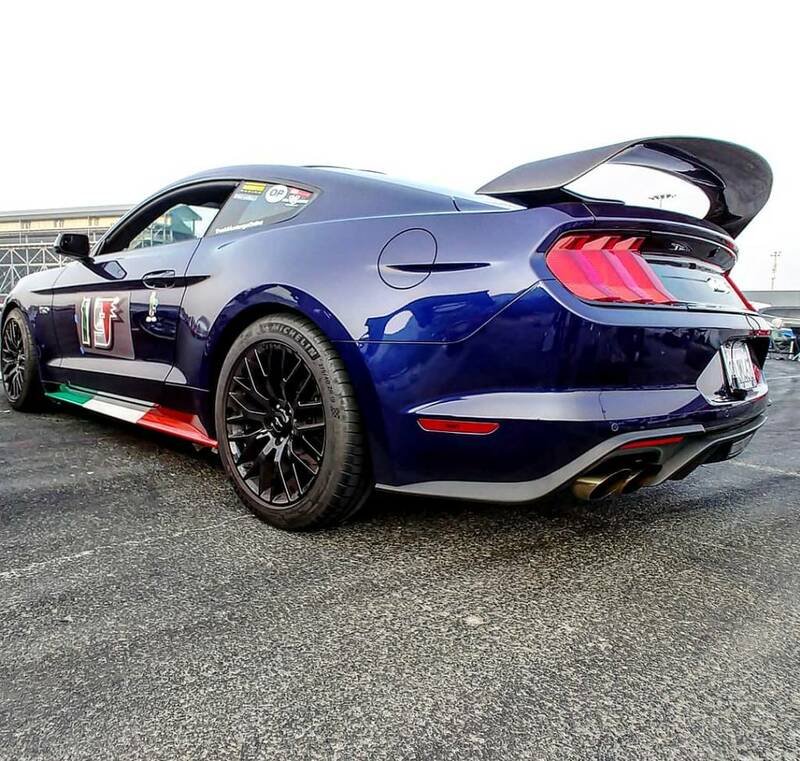 If you're going to do time trials I'd also look at one of the APR wings over the GT350. Think GT500. Thank you for that tip about removing weight from the front versus the rear. Searching E-Bay now and going to put out some feelers for a new OEM deck lid. APR 250 Wing and front splitter seems the route to go. Here Anderson composite for 2018 mustang. The wing is higher but smaller than a 350r wing. It is definetely a nice piece. RaiderJatt02, Bill Pemberton, Apex3V and 2 others like this. Tommy J and VoodooBoss like this. I suggest SBS performance splitter. I have had mine on for 2 years and no damage. Looks like knew. Check them out. Bill Pemberton, flyhalf and VoodooBoss like this. Google SBS performance parts and he’s on Facebook too. Have been using MGW shifters since around 2001 and it did not matter if it was in a Viper or a Mustang, the change was always dramatic. I have busted the chops of my friends and customers for close to 20 years telling them this is one of the first options they should get for their Mustangs, Corvettes , Camaros, or Vipers! As good as the shifters have become, MGW takes them to a different level. I am biased , but there is not another short throw shift kit that even measures up to the quality and commitment of crazy George's system. Appreciate your post as it just validates the MGW kit for so many others. Easy to buy direct at www.mgwshifters.com . Toured the facility years back and even with the ton of new CNC machines, the floor is like a Nascar shop, you swear you could eat off the floor!! Apex3V, Tommy J and JeffV8 like this.